It's time again for a new Book of the Month! 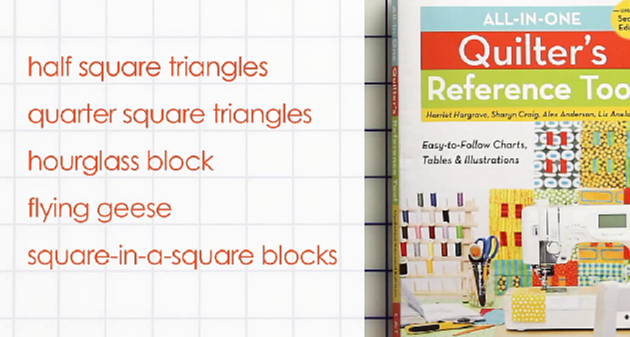 This month we selected All-in-One Quilter's Reference Tool as our March 2014 Book of the Month. This book is a MUST HAVE for quilters, and is a great reference for designing your own patterns. We are giving a few away today, but do not forget the Book of the Month is 20% off all month! The All-in-One Quilter's Reference Tool has been on Kimberly's sewing room bookshelf for years. When C&T Publishing decided to release a second edition, we couldn't wait to feature it as a Book of the Month! This handy guide has helped many aspiring quilt designers get their feet wet, aiding them with the dreaded quilt math that you will eventually grow to love. There are many measurements and calculations that go into a quilt. What are the calculations for a half square triangle? How big is a standard twin sized quilt? How much backing/binding/batting do I need? With this reference book by your side, you will never wonder again. Today we are giving away THREE copies of the new All-in-One Quilter's Reference Tool to three lucky winners. Are you a new quilter or a budding quilt designer? This book will help you along the way. To enter, comment below on this post and let us know what quilt math calculations always trip you up. Winners will be chosen Monday, March 10. Good luck!